Mix one serving in 10 oz. of cold water in a shaker or glass 15-30 minutes prior to exercise. Do not exceed one serving at any one time. Do not exceed two servings per day. 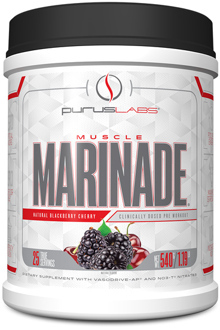 Muscle Marinade contains extended release caffeine; do not consume within 6 hours of bedtime. Muscle Marinade is intended only for healthy adults over the age of 18. Do not use if you are currently pregnant or nursing, could be pregnant, or are attempting to become pregnant. Consult a licensed healthcare practitioner before using this product. Discontinue use and contact a doctor immediately if you experience an irregular or rapid heart beat, chest pain, shortness of breath, dizziness, lightheadedness, fainting or presyncope, tremors, headache, nausea, or other similar symptoms. If you are a performance athlete, please check with your sanctioning body prior to use to ensure compliance. Muscle Marinade was engineered using a detailed, systematic and scientifically sound approach including only those ingredients supported by peer reviewed and published scientific data.